Clothing in Ancient China was a symbol of status. The rich and the poor dressed quite differently. The poor people, or peasants, wore clothing made of hemp. This was a rough material made from plant fibers. It was durable and good for working in the fields. Generally clothes made of hemp were loose fitting pants and shirts. The people of higher status wore clothes made of silk. Silk is made from the cocoons of silkworms and is soft, light, and beautiful. The Chinese were the first to make silk and kept how to make it secret for hundreds of years. Silk garments were generally long robes. They could be dyed specific colors or with fancy designs. There were many rules around colors and who got to wear what type of clothes. Only certain people, like high ranking officials and members of the emperor's court, were allowed to wear silk. Lower ranking people could actually be punished for wearing silk clothing. There were also rules describing what colors people could wear. Only the emperor could wear yellow. 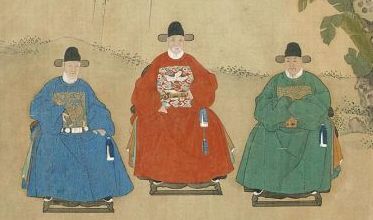 During the Sui Dynasty poor people were only allowed to wear blue or black clothing. The color of clothing also symbolized emotions. White clothing was worn during mourning (when someone died) and red was worn to show joy and happiness. When the Mongols conquered China during the Yuan Dynasty they brought cotton clothing with them. Cotton clothing became popular among the poor because it was cheaper, warmer, and softer than hemp. Hair was considered important in Ancient China. Men tied their hair into a knot on top of their head and cover it with a square cloth or a hat. Women braided and coiled up their hair in various styles and then decorated it with hairpins. Girls were not allowed to curl up their hair with hairpins until they were married. Most people wore their hair long. Short cut hair was often considered a punishment and was sometimes used for prisoners. Monks shaved their hair to show that they didn't care about looks or value of long hair. Jewelry and adornment were an important part of fashion. Not only were they used to look good, but they were also used to signify rank. There were many specific rules about who could wear what, especially for men so that others could quickly tell their status. The most important jewelry for men was their belt hook or buckle. These could be highly decorated and made from bronze or even gold. Women wore a lot of jewelry in their hair such as combs and hairpins.